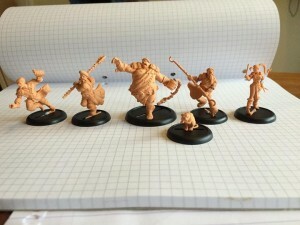 Guild Ball lets us know how things have been moving along on their fantasy sports project, along with a new 3D print preview. first off, after my awesome holiday and less than aweseom post-holiday sickness, I got back into the writing saddle and have got around 80% through a complete rules re-write...12k words of technical writing is no small task...my huge thanks to everyone who has supplied feedback and editing, made it much easier...you'll all be getting credits in the book! i've focussed in on removing all the dodgy bolding and italics etc...further i have made all of the language consistent and named key game elements properly (no more 'advancing' its all movement now for example) as well as re-writing complete sections to make it easier to understand and to remove ambiguity. i'll be releasing the 'first final' edit this week...this'll need fine-tooth comb reading...and then we should be done!